First Line: Old Henry Lee stood transfixed by all the commotion at the Panama Hotel. What caught my interest about this book is that it covers an area of US history that is often neglected in high schools. The story of what happened to Japanese Americans living in the United States during World War 2. The story is based on true events. In 1986, the Panama Hotel uncovered hundred of materials that had been boarded up and forgotten in the basement. When the US military began evacuating Japenese Americans and moving them into the internment camps, many family stored their most valuable possessions in the basements of churches, hotels, etc. with hopes of returning one day to reclaim their belongings. The story opens on the day when this great historical find is discovered and boxes are being brought out of the hotel basement. 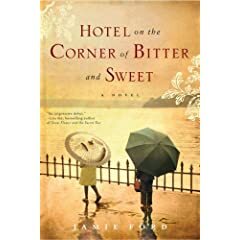 The main character Henry Lee is witness to these events, and the sight of a small parasol leads him into a trip to his past, of growing up Chinese in Seattle in 1942. The chapters jump back and forth between 1942 and 1986. From the chapters of Henry’s past, we learn about his struggles with racism, with bullies at his “all-white” school and trying to understand his parents who force him to “speak his American” and no longer speak Chinese. During those trips to the past, we understand the relevance of the small parasol the day Keiko is introduced into the storyline. She is a Japanese American, working the lunch time cafeteria shift with Henry as part of their scholorship to attend the private school. The chapters follow the lives of Henry and Keiko as they try to make sense of the climate of animosity, tension and hatred all because of a person’s nationality and heritage. The book is beautifully written, and I felt transported to 1942 Seattle walking with Henry and Keiko, living their adventures with them. I finished the book in only a couple of days, I couldn’t put it down once I picked it up. My only complaint about the book is that the ending seemed to wrap up a little too neatly and didn’t really fit with the flow of the rest of the story. I did enjoy seeing the parallels between the families in the family. The relationship between Henry and his father, Henry and his son, Marty. The story discusses a very important part of US history that I think recieved only a footnote mention in my high school. It is something the US should be ashamed of and make amends for. I’m glad there is a book like this out there to shed light on this part of our history and in a way that is real and unbiased.